The Naso-pharyngeal tonsil or adenoids is a collection or overgrowth of the lymphoid tissue on the prosterior wall and the roof of the naso-pharynx, which normally atrophies and disappears in early life. Ø Hypertrophy and infection of this lymphoid tissue commonly occurs during childhood as a result of repeated infection of the upper respiratory tract. In some children, this enlargement becomes permanent with resultant deleterious effects on the nasal passages, middle ears, pharynx and chest. 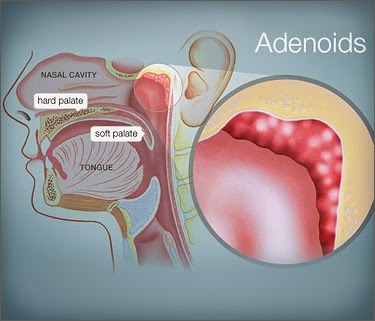 Ø Chronic hypertrophy and recurrent infection of the tonsils often accompanies these adenoid changes. ü Blocking of nasal airways makes the child suffer from nasal obstruction and there is consequent amount breathing. ü There is chronic nasal discharge and often associated sinusitis. ü Snoring and nocturnal cough are common. ü In some cases the voice becomes hoarse with a thick nasal intonation. ü In some cases adenoid affects the middle ear cleft. ü Recurrent acute otitis media is not uncommon. ü There is intermittent earache with variable conduction deafness. ü Persistent or recurrent bronchitis may be aggravated by adenoids. ü In older children adenoids, when associated with enlarges tonsils, interfere with the child’s development. ü Adenoid can cause serious feeding difficulties with babies. ü The child is mentally dull and slow. ü Enuresis and night terror may occur. ü The appetite is poor, and the child eats slowly. ü Disturbed sleep, the discomfort and nasal obstruction and sinusitis and impaired hearing makes the child appear physically and mentally slow and unresponsive. v Vitamin D foods and other D products are useful. § Hydrastic Can: is the first remedy to be tried, when the mucous membrane is yellow and there is excessive enlargement. Hydrastic with glycerine in the ratio of 1:6 may also be applied externally through nostrils. § Calcaria phos: is highly recommended by several doctors id repute, as it is highly efficacious in adenoid hypertrophy. If there is fever in adenoidc, calc. IODIDE may be used. § Baryta Carb: will be useful when tonsillitis is mixed with it. § Agraphis Nutans: obstruction of the nose from adenoid; deafness, child breathes with the mouth open. This remedy will prevent surgery. § Tuberculinum or Bacillinum: may be used as an inter- current remedy once a week. § Cistus Can: Cistus has a special affinity for the bad throat. It suits individual with scrofulous or arthritic tendency and suffering from adenoid ; sensation of heat and dryness in throat makes the patient drink water for relief. § Baryta Iodide: If the child is mentally weak. Symptomatic Homeopathy medicines helps for Adenoids. Its good to consult the doctor to get symptomatic treatment.